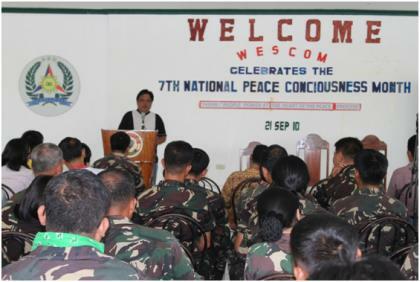 Puerto Princesa City (29 September) -- Observing the National Peace Consciousness Month, the Western Command (WESCOM) enjoined its soldiers to attend last September 21 a lecture/seminar on the rights of the Indigenous People and the laws that protect them which was held at the Command's Headquarters, Camp Artemio Ricarte, Puerto Princesa City. In line with this year's theme "People Power at the Heart of the Peace Process," WESCOM soldiers were enlightened on the constitutional and statutory safeguards of the rights of the members of the indigenous groups. "It is important that our soldiers should be reminded of these things especially because we are sometimes drawn within the indigenous people's domain while conducting a military operation," Major General Juancho M. Sabban, WESCOM Commander, said. Engineer Roland Parangue, Provincial Coordinator for the National Commission for Indigenous People (NCIP) who was invited as a resource speaker, explained the concept of the ancestral domain and highlighted important points in the Indigenous Peoples Rights Act or the IPRA Law. "We have to make sure that in the course of performing our sworn duties, not a single act of transgression against the rights accorded to these people will be committed by any member of the WESCOM, or the entire armed forces for that matter," MGen Sabban stressed. "The AFP Chief of Staff, under the directive of President Benigno Aquino III, has put the highest premium to adherence to human rights observation in the conduct of all military operation, and we will strongly abide by that order. Peace can be achieved without sacrificing the rights of the people," the WESCOM Commander added. The seminar/lecture was another gesture by the WESCOM to solidify its relationship with the different sectors of the community. Last month, the WESCOM sat down in a two-day forum with representatives from the Puerto Princesa City Police Office (CPO) and the members of the different indigenous groups in the province of Palawan and the city of Puerto Princesa to discuss and clear issues vital to the Command's good and harmonious working relationship with the indigenous people. Former Philippine President Gloria Macapagal-Arroyo declared September as the National Peace Consciousness Month through Presidential Proclamation No. 675 on July 20, 2004 with the purpose of bringing together all government agencies and encourage local government units and civil societies to join the celebration. September was chosen as the month of celebrating the National Peace Consciousness because many of the important events and occasions aimed at promoting peace in the country happened in this month. These are: Signing of the peace agreement between the Government of the Republic of the Philippines (GRP) and the Cordillera Peoples' Liberation Army on September 13, 1986; Creation of the National Unification Commission which studied and recommended the adoption of the comprehensive peace process on September 1, 1992; Creation of OPAPP thru Executive Order No. 125 on September 15, 1993; Signing of the Final Peace Agreement between the Government of the Republic of the Philippines (GRP) and the Moro National Liberation Front (MNLF) on September 2, 1996; Launching of 2001-2010 International Decade for Culture of Peace and Non-violence for the Children of the World on September 19, 2000; and International Day of Peace as declared by the United Nations on September 2000.